The dilute platinum is believed to be the combination of the platinum gene and the dilute gene. The platinum gene is a dominant, homozygous lethal gene and is discussed on the platinum page. The dilute gene is one of the least understood of the Campbells genes. It has not yet even been documented as a gene or given a genetic symbol, but it is believe to be a recessive gene. One of the reasons that it is so hard to understand the dilute is that it is really only visible with two other genes: the platinum gene and potentially the black gene. As you can see above with the platinum gene, it removes all color. 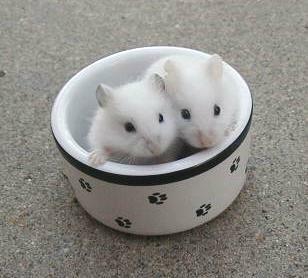 You are left with a totally white hamster with either black or red eyes depending on the genetic make-up of the hamster. The red-eyed can easily be confused with Albinos, and indeed they are impossible to differentiate by phenotype alone. 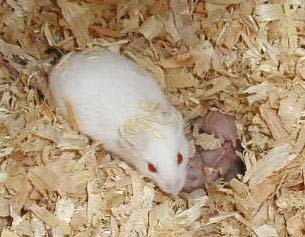 Knowing the pedigree or doing test matings may be the only way to differentiate a red-eyed dilute platinum from an Albino. 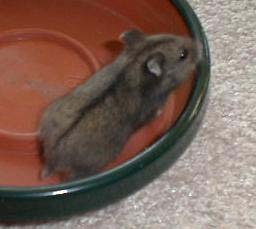 Dilute black hamsters are a lighter black color, and this may or may not be due to the same gene which causes the lightening in dilute platinums. Personally, my experience leads me to believe that there is not a connection to the dilute platinums, but I have not been able to prove it conclusively. On these so-called dilute blacks, much of the brown color of the normal color shows through. Most breeders will not keep these for breeding but will push them into the pet stock where they are very popular. Some breeders have succeeded in significantly darkening the color of their blacks by only keeping the darkest and blackest blacks for further breeding. Dilute blacks should not be confused with the silvering in the blacks. 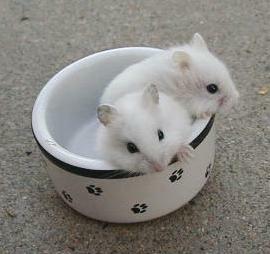 The silvering causes white hairs to be mixed with the black almost giving the appearance of a hamster who is going gray. With dilute blacks, there is a brownish-black color. Some actually look more like normals who have rolled in soot. This is an example of a so-called Dilute Black. You can see that he is far from jet black with a lot of brown showing through the coat. Few breeders would keep these animals, but they are popular among pet owners.